Samsung, a world leader in award-winning innovation, is leading the charge in multi-function devices with a new line of three 6-in-1 digital still cameras that offer video and voice recording, music playback, data storage, and web capability in addition to producing high-quality digital stills. The ultra compact Samsung SC-MS20 digital camera combines multiple functions with full 6 Megapixel photo quality and the best MPEG4 recording quality (640x480, 30fps) available in a digital camera. Samsung innovative 6-in-1 still cameras will be on display during CES 2006 at the Samsung booth in the Central Hall of the Las Vegas Convention Center. The SC-MS20 will be available in May 2006 at $399.99 MAP. 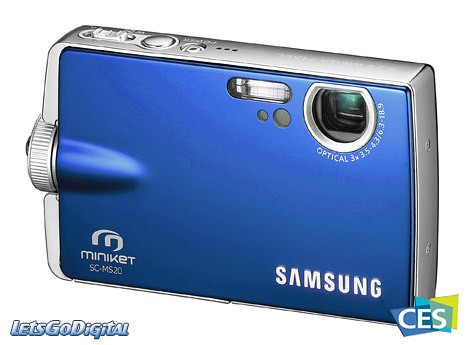 Samsung Miniket MS20 digital camera - "The popularity of cell phone cameras has demonstrated the favorable consumer market for true multi-function portable devices," said Aaron Novak, Marketing Manager for Camcorders, Samsung Electronics America. "Samsung newly introduced line of 6-in-1 digital cameras packed with multi-functional features are market leaders in innovation and take portable devices to the next level. 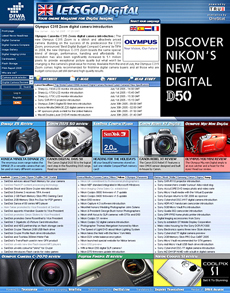 They combine the versatility consumers want with the ability to capture memories in full 6MP quality." Samsung Miniket SC MS20 camera - MPEG4 and Image stabilizer - The Samsung SC-MS20 model combines 6 Megapixel digital stills with high-quality MPEG4 recording allowing users to preserve those special moments in either photo or video format. Ultra-compact, with a chic magnesium body, the multi-function digital cameras slip easily into a pocket. A 3x optical zoom lens and a 3 inch wide LCD make it easy to capture the perfect shot while the built-in movie and photo image stabilizer supports the picture clarity. Samsung MS20 camera - LCD display and Memory - A sliding lens cover protects the lens from dust and scratches, and four Hot Keys provide shortcuts to the most frequently used functions according to the selected mode. The mode dial lets users switch functions easily with status displayed on the LCD screen. The camera can be charged via USB connection to a PC (when the power is off). The Samsung SC-MS20 includes 64MB built-in memory and comes with an SD/MMC slot for increased storage capacity.